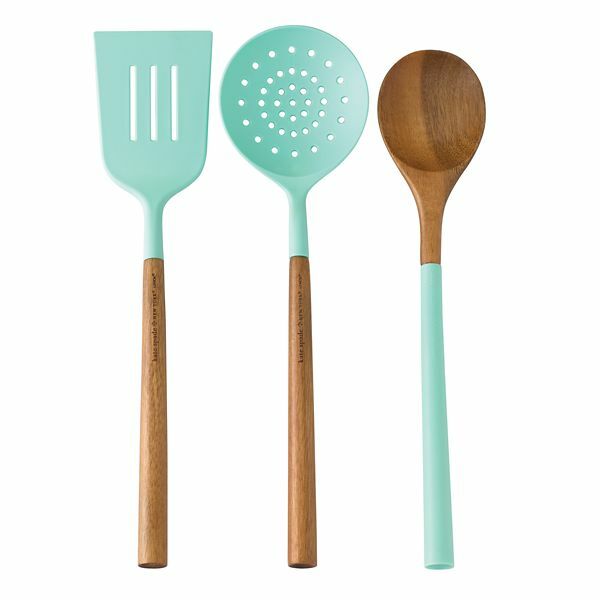 I hope you will love these turquoise kitchen accessories I rounded up! Clearly, I love turquoise. I’ve always loved turquoise, but it wasn’t until moving lakeside that I felt liberated enough to really embrace the color. In the townhouse I really played it safe because I was so concerned with resale. (I did hide some turquoise kitchen accessories behind my plain wood cabinets doors though!) My style, as you’ve seen, is actually much bolder when I’m not constrained by trying to create a space everyone will love. I’m the gal who once painted my car lime green – I’m drawn to color. After painting my kitchen cabinets turquoise, and realizing how HAPPY the room made me, I started to play pretty fast and loose with the color, peppering in some vintage blues and shades of green so it’s not all aqua, all the time. There’s even a little bright orange here and there. It’s been almost three years since we moved to the lakehouse and Hubby and I both agree that our house feels happy and uplifting – and very “us”. 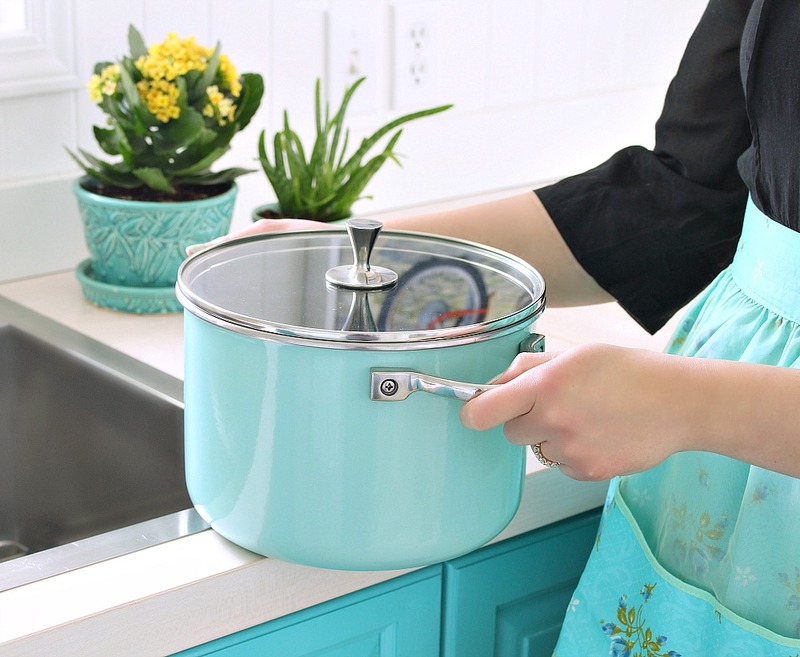 If you’ve been wanting to add a dash of aqua to your kitchen, without going all in like we did, I’ve rounded up my favorite cheery – and practical! 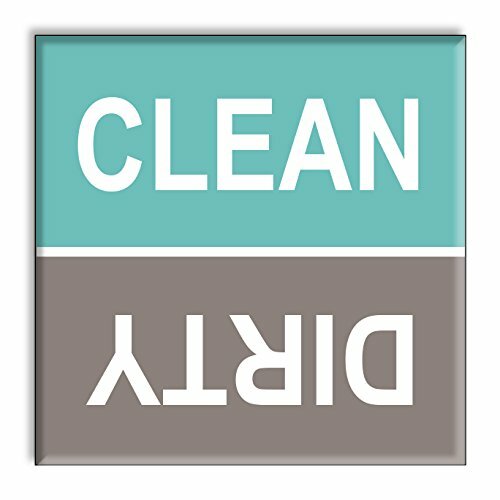 – turquoise kitchen accessories. 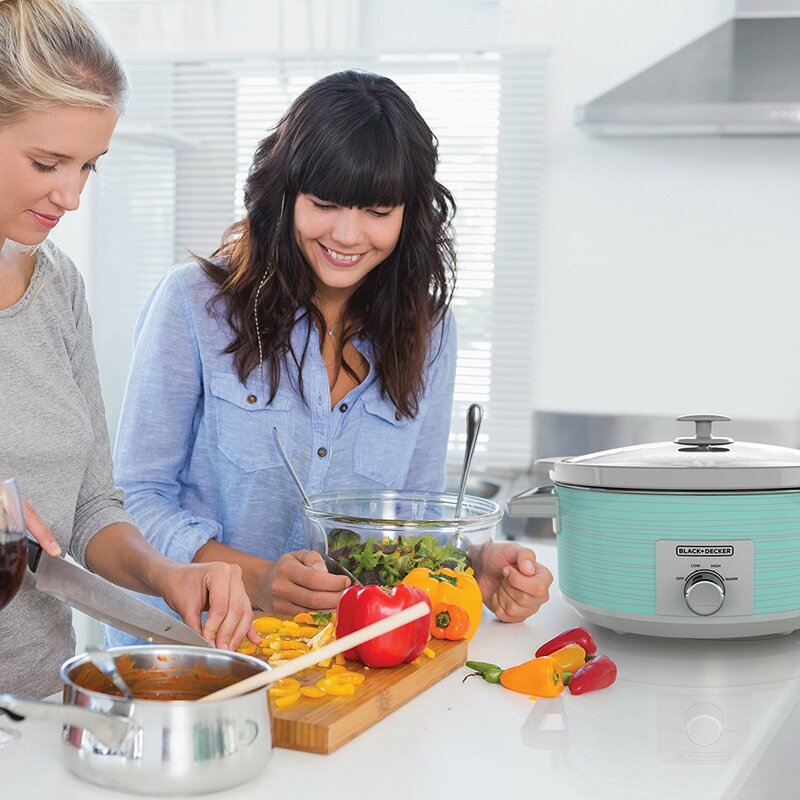 There’s tons of aqua kitchen accessories out there, from cutting boards to kitchens tools, but these are my favorites because they have that perfect mix of modern-retro I love. 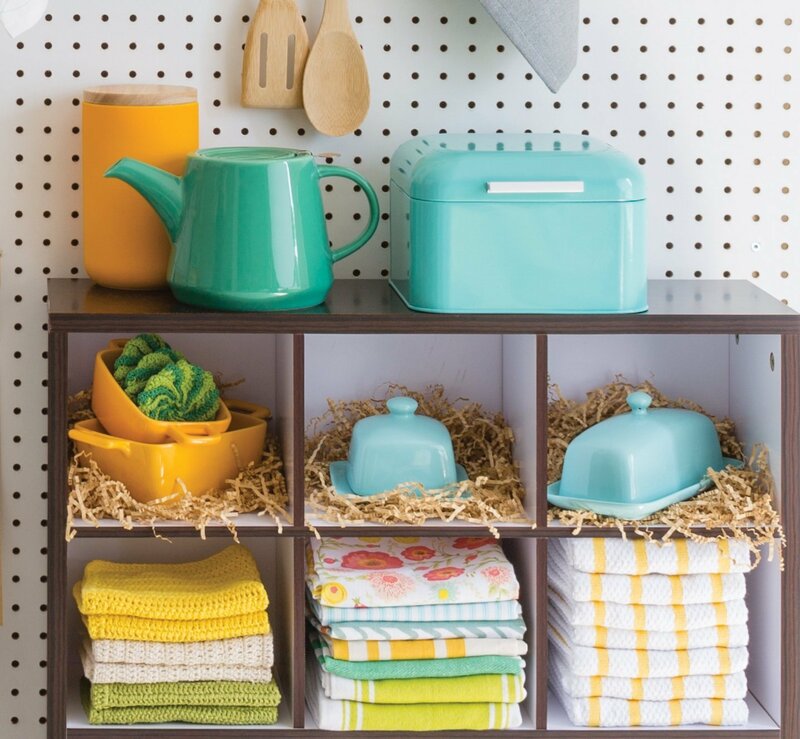 Could this retro-inspired turquoise bread box be any cuter? The shape reminds me of an Airstream trailer. 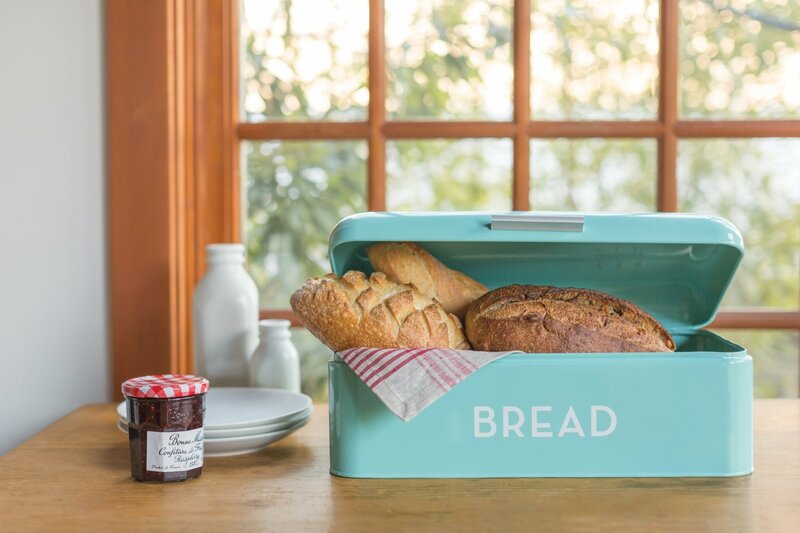 If you don’t have room for a breadbox – or want a matching set – this bakery box is too cute! I’m eyeing it up for storing cookie cutters or kitchen odds and ends. 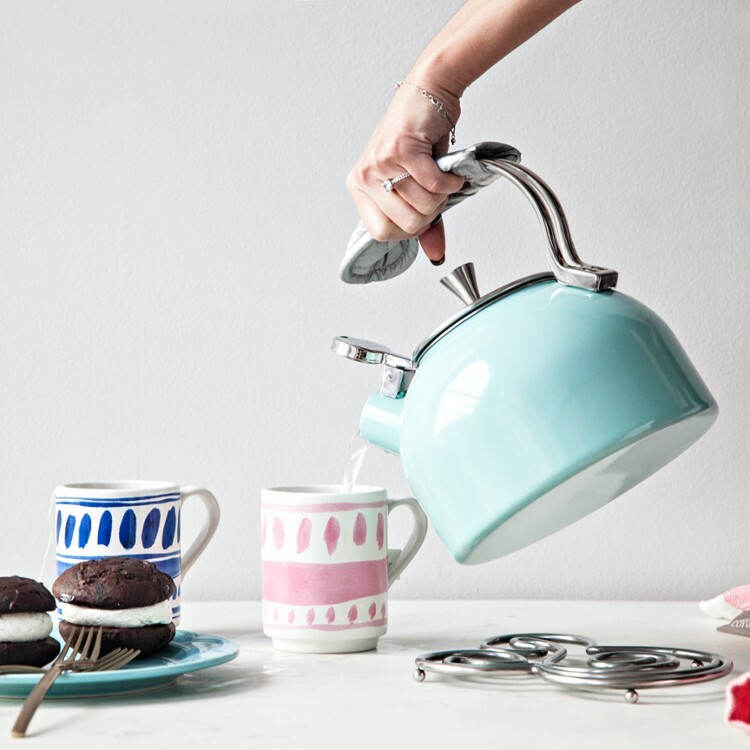 I love the retro look of this Kate Spade kettle and that soft turquoise hue is pretty perfect. However, this turquoise kettle from Amazon is pretty cute too – its handle is even turquoise. I still use my old porcelain Melitta pour-over brewer, but I’m tempted by automatic coffee machines. I drink so little coffee at home (I’m an avid tea drinker at home, an insatiable coffee drinker when I’m out), but I’d be tempted with a beauty like this on the counter. P.S. 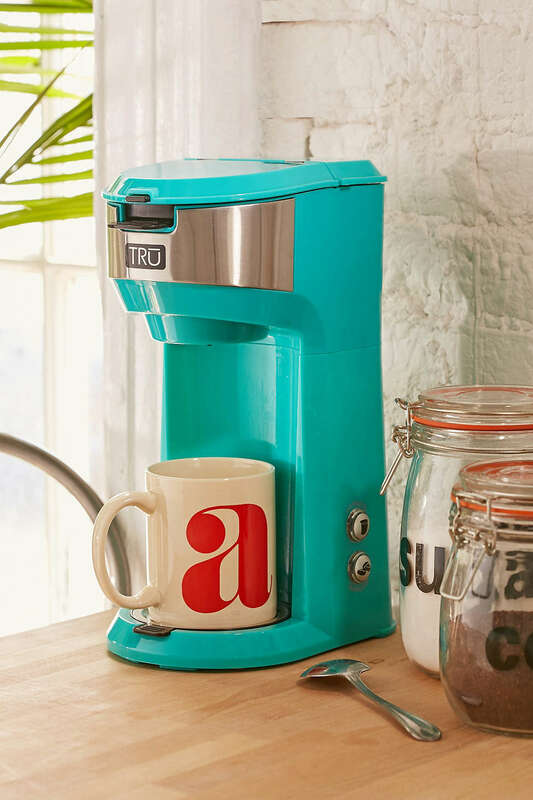 Keurig makes a cute turquoise coffee maker too. Don’t laugh at me, but when Hubby and I drove to Minneapolis MN one year, getting this cup from Target was definitely one of my main objectives! 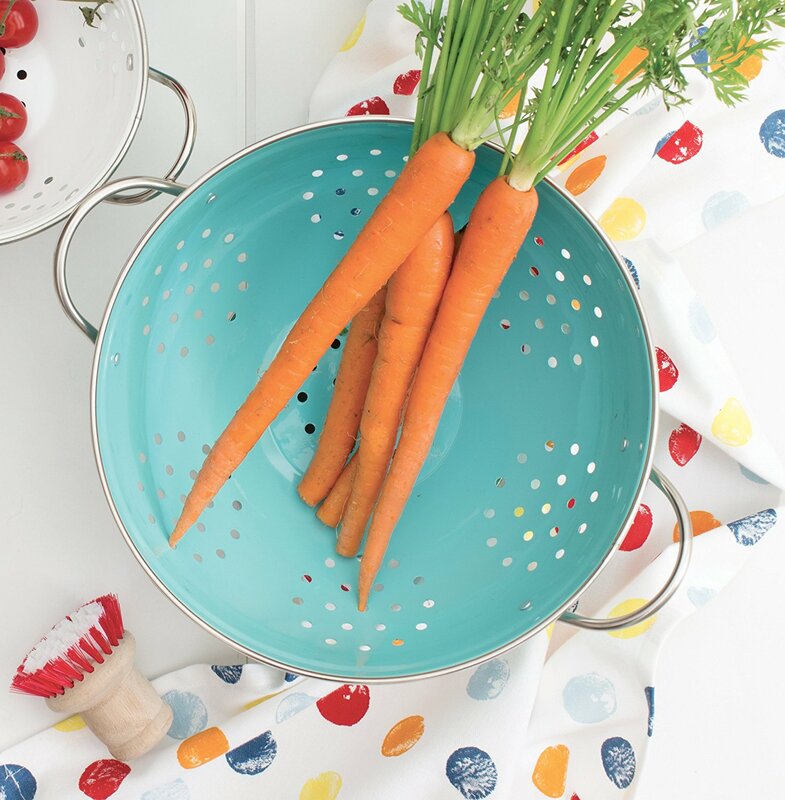 I also picked up a turquoise colander at the same time. This is why I’m the person to write about turquoise kitchen accessories, haha! My oven mitts are so old and – SHOCKER – not aqua. They’re about the give up the ghost so I’m already casually shopping for another set and this seems like a good deal – 5 pieces for under $18! 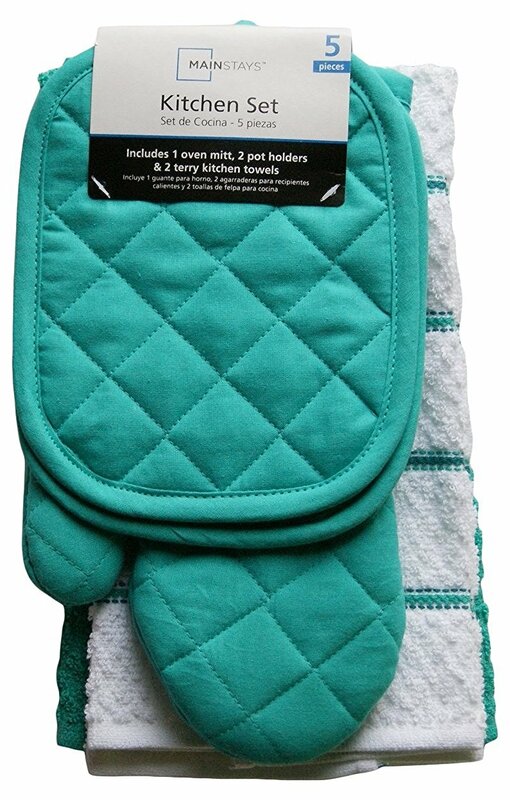 This set of turquoise tea towels is pretty too. 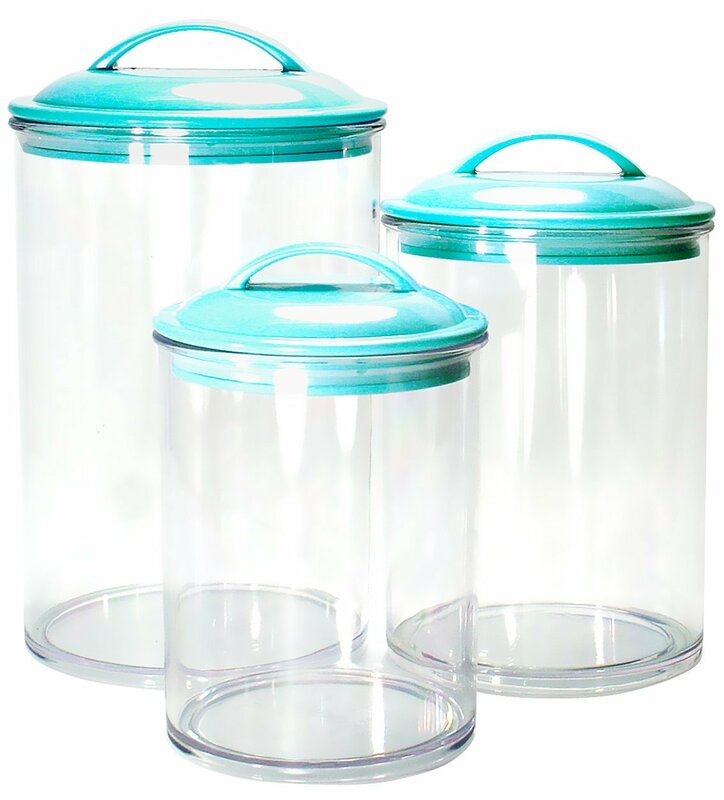 I found a second set of turquoise metal canisters, if plastic isn’t your jam. I am obsessed with keeping food in sealed jars because I’m terrified of pantry moths! Our kitchen timer just up and died one day – and I almost burned the Shepherd’s Pie! It was an awesome magnetic timer with multiple hours and two separate timers, which we used everyday. 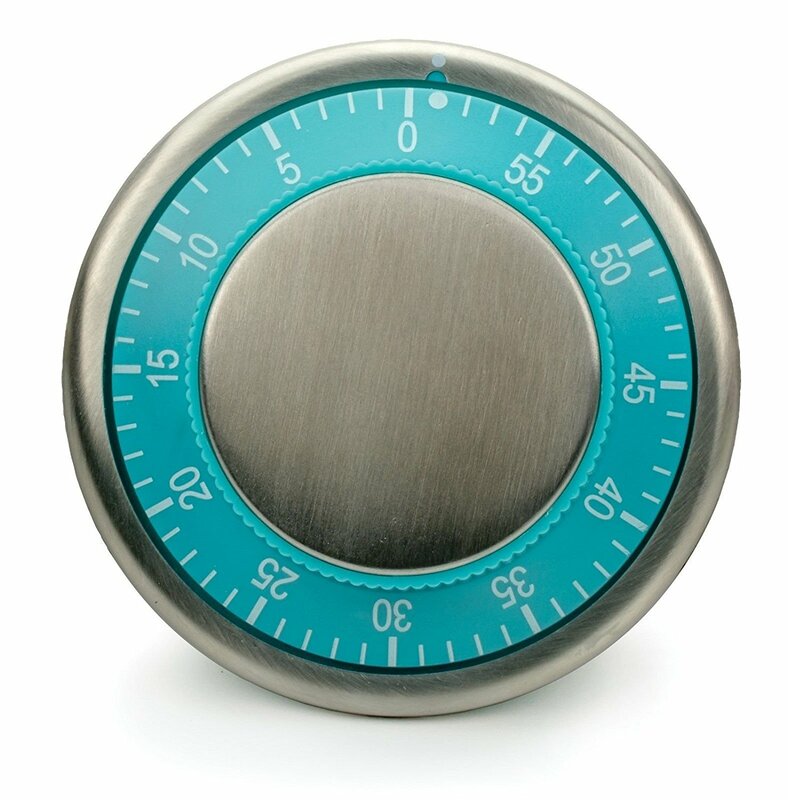 I cannot find its replacement and I’m so bummed, but this turquoise kitchen timer might help me deal with the loss. 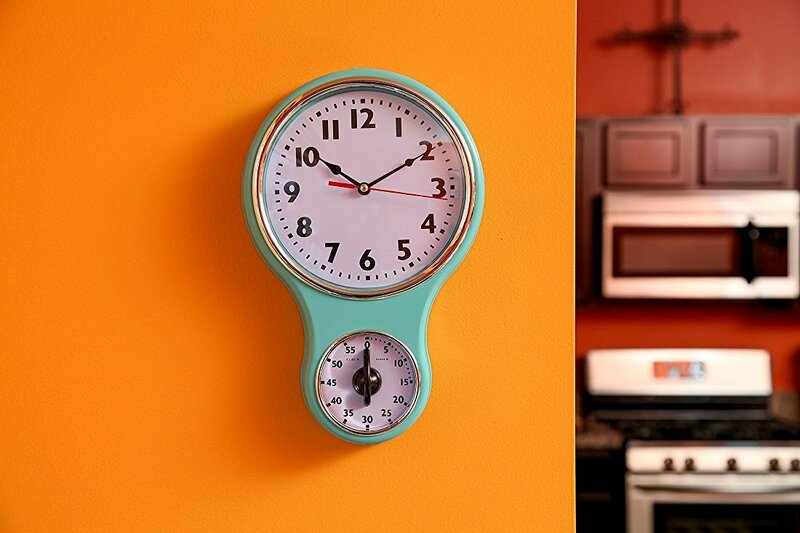 This retro turquoise clock with timer is SO similar (I love how more of the aqua shows) but they’re both cute, frankly! With a built-in kitchen timer – that’s handy! They position the candy-colored stand mixers right by the entrance of my local Canadian Tire and I stop to ogle them every. single. time. 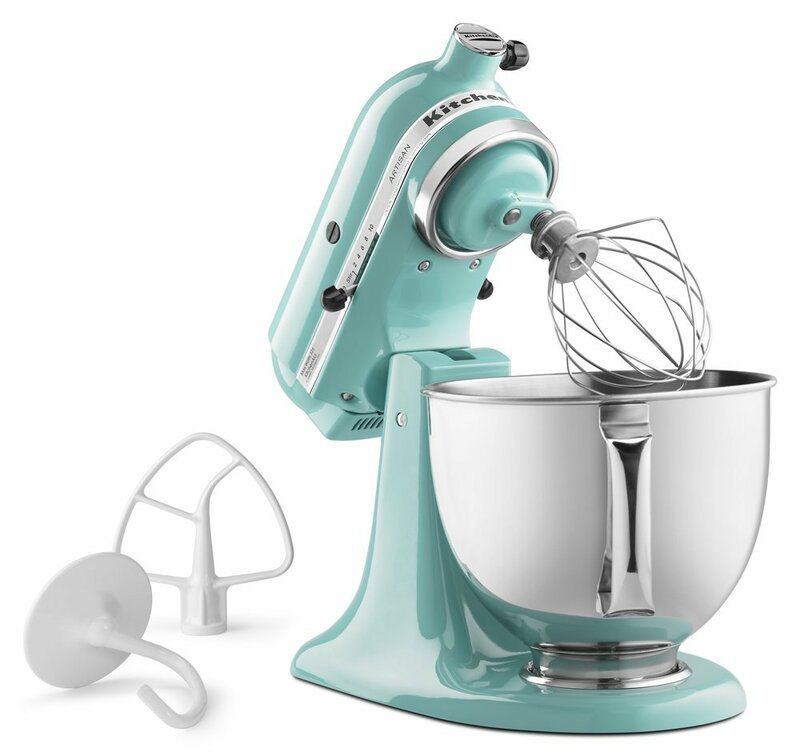 I have a perfectly good turquoise hand mixer and a million bowls so I really can’t justify this purchase but maybe when we renovate our kitchen and there’s far less aqua, I’ll splurge because it would look so good out on the counter. 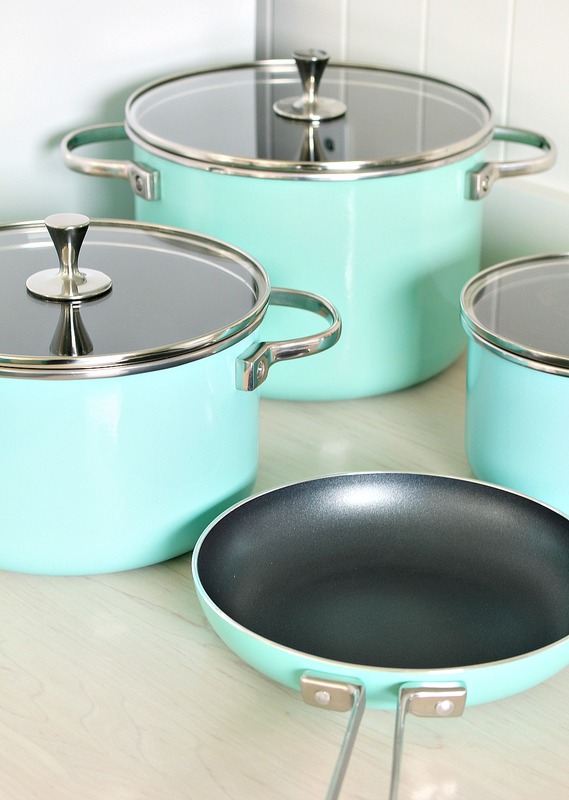 I am still loving my turquoise Kate Spade non-stick pots (here’s the sauce pan) and non-stick pans. When I first used them I still used a little oil, but these days I barely use any – usually none – which has been fabulous because I liked being able to control the amount of cooking oil/fat I consume. They are just so cheery and they look great on the stove top. I swear, they make cooking more enjoyable! Plus they wash up easily and seem to be great quality. 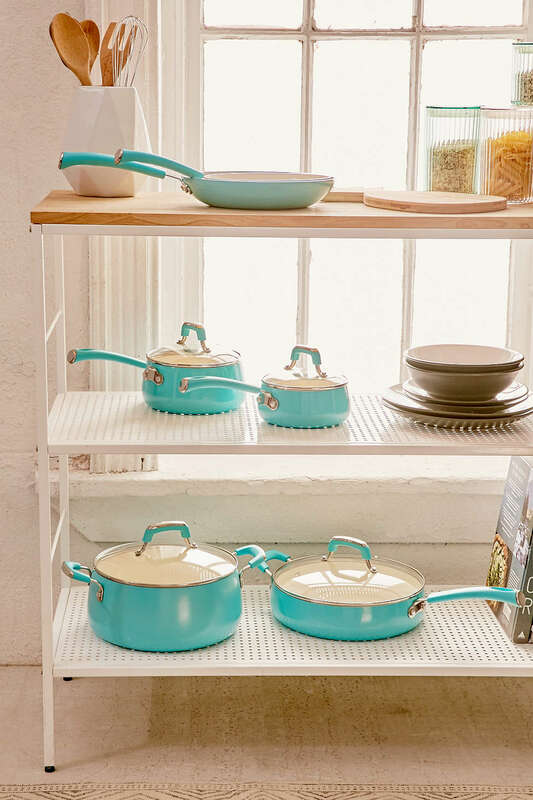 But this Urban Outfitters turquoise cookware set looks like a great deal too, and Rachel Ray has a great turquoise pot set as well. 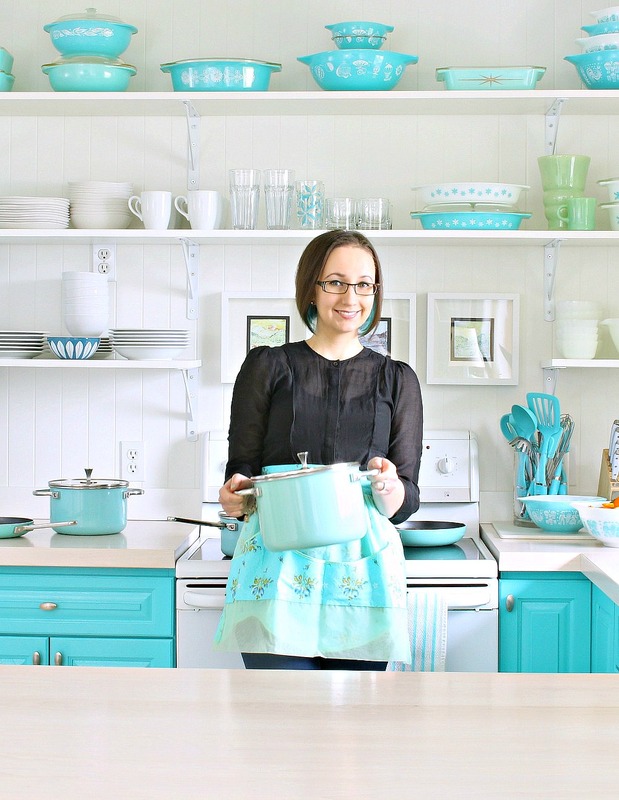 Wow – I didn’t realize until now how abundant turquoise pots and pans are! I have a ridiculous number of blenders: three, to be exact. 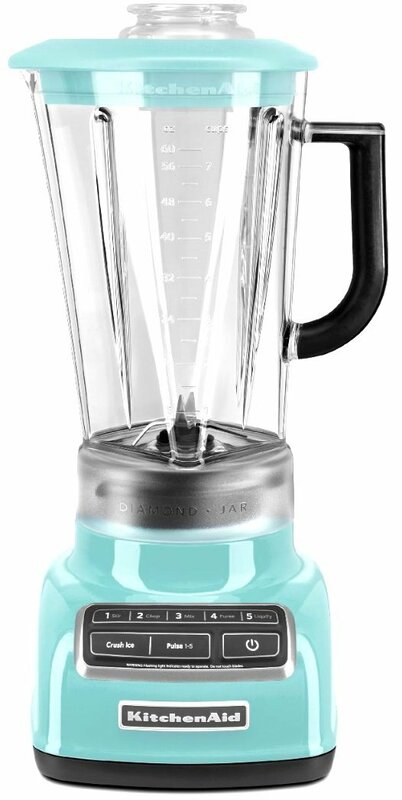 My turquoise blender, another cheap blender from Costco when it looked like my turquoise one had failed (we fixed it!! ), and a magic bullet for when I’m making smoothies solo. We love a good protein smoothie around here, so I devote precious cabinet space to two of my three blenders. I used to love a toaster oven but when ours failed, my Mummu gave me a four slice toaster she got for free. It’s worth something like $200 and darn it if it isn’t the best quality toaster I’ve ever used! 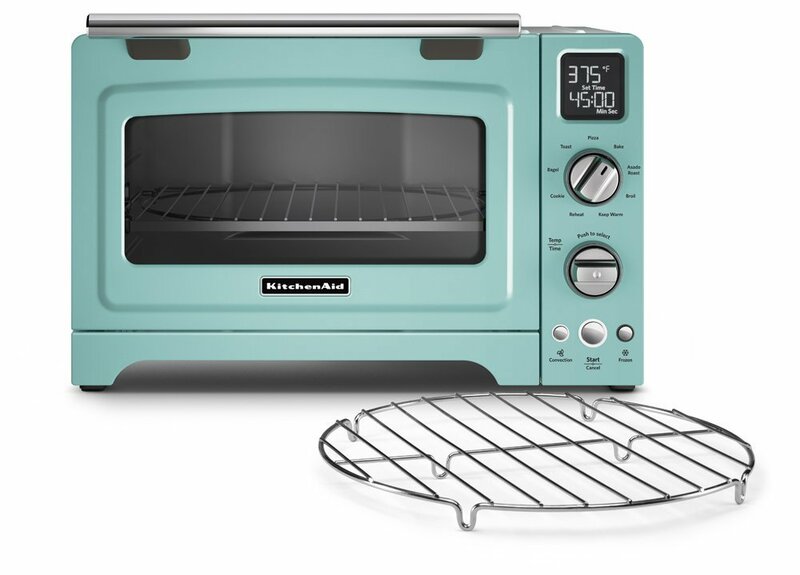 If it ever bits the dust, this turquoise toaster will be my first choice. 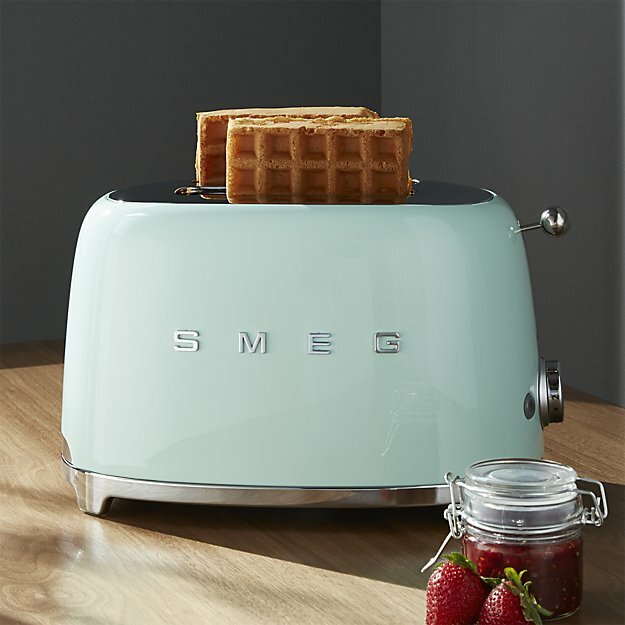 I don’t think I’ll ever have the cash for a Smeg fridge, so I love the idea of getting one of these cuties at least, to capture that retro vibe. Who else is craving waffles now? I have recently added a mix of worn wooden spoons to my chrome and turquoise KitchenAid tools (which I store in a clear glass vase on the counter). I’ve added a few wood accents all over the kitchen, actually, and I love how they’ve warmed up my turquoise kitchen without adding another color and breaking my mostly monochromatic palette. 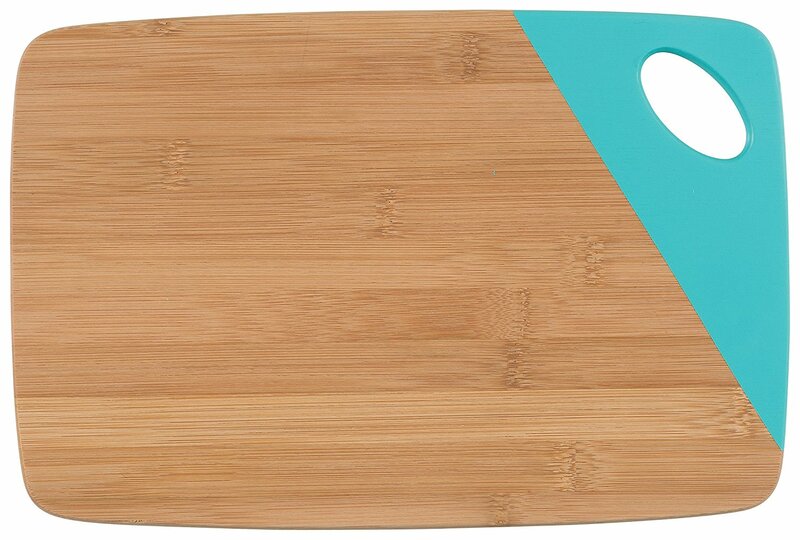 Another way to pair up wood and turquoise: this sweet “dipped” bamboo cutting board! 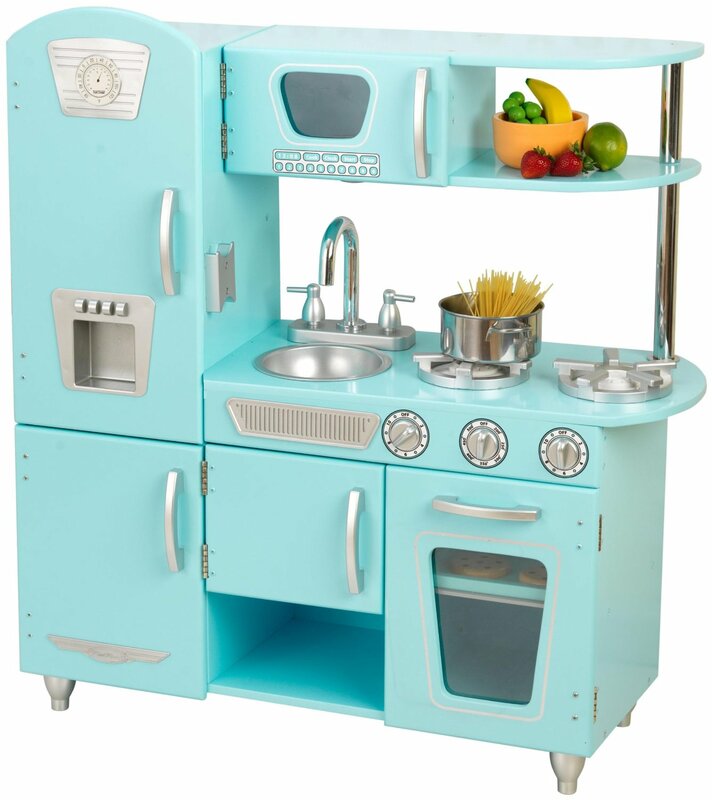 I love this retro aqua kid’s play kitchen SO much, it would be the best kitchen accessory of all time for a family with littles… Plus, it’s under $100 with free shipping right now! Technically this doesn’t fit with the other strictly turquoise kitchen accessories but I couldn’t not include this beauty! 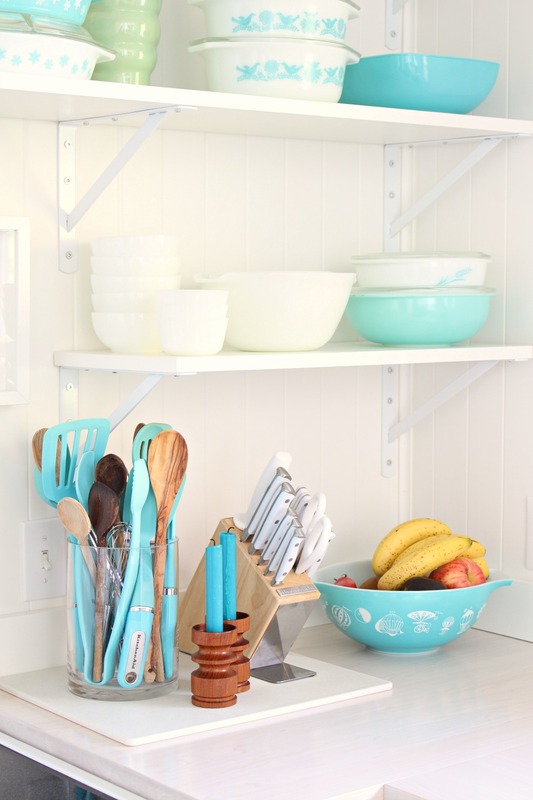 There are quite a few things on this list I’d love to add to my turquoise kitchen. 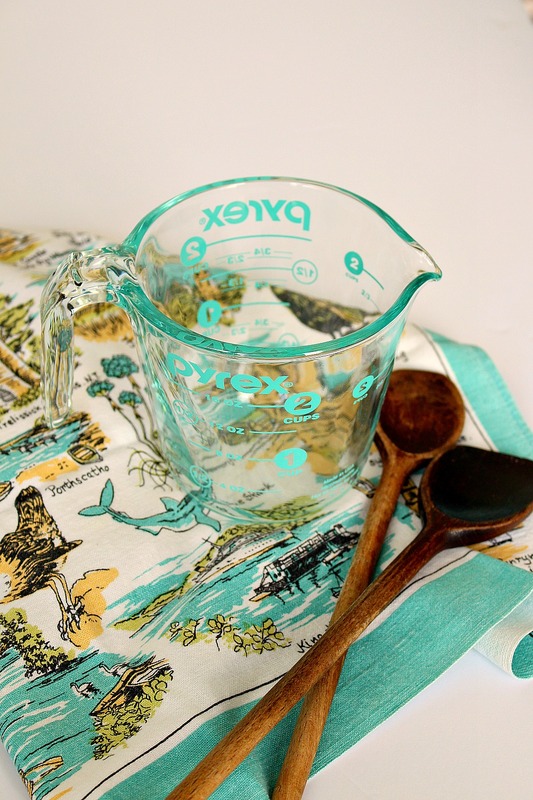 Have you found any cute turquoise kitchen accessories lately? You have quite the collection! I'm really considering the metal canisters (hear that, pantry moths? )Btw, how is Charlie-the-Lime-Green-Car doing? I loved how much you loved him! I was so upset when my parents sold our oldest car without even telling me. It felt like losing an old pet. Haha – you tell those pantry moths! I have gone quite nutty with putting every single thing in a jar but it's made life so much easier. Charlie is still languishing in our driveway. We meant to donate him to a charity that asks people for old vehicles, but I couldn't part with him. It's terrible! I've been trying for years to say good-bye and I just lose my nerve each time. I saw someone make a porch swing out of the back end of an old car – trying to talk Hubby into that, lol. Can you paint your white slow cooker so you can love it more? That's an interesting idea! The metal could likely be painted with a heat safe paint (I think they make paint for stoves, but the colors are limited), but the design of mine is such that the metal part is sort of eclipsed by the ceramic part which is the truly offensive area, lol. It's pretty ugly. I'll have to see if there's a heat save turquoise paint around – thanks for that idea! Wow! What a portfolio of turquoise! That was quite comprehensive. The photos that included other pops of color (besides white and turquoise) are much more interesting visually. Bright yellow, in small doses, would enliven a mono color palette. Better yet, bright yellow and a pastel like green or pink or even coral, would be visually more interesting, have more depth and bring more richness to the space. I think that might be true for most mono color palettes. That one extra color, or two, makes a surprisingly beautiful difference without compromising the core color vibe. I really enjoy reading your blog and the details you provide in both photography and content. You are so very talented and I applaud and commend your creativity! I hope to purchase something from your vintage shop soon! Thank you! Thanks for your kind words! So nice to hear you enjoyed this round up. I kept saving/pinning all of these turquoise goodies for myself, haha, and thought I'd share for anyone else who wants a little dose of aqua in the kitchen. I agree: aqua and orange or bright yellow look sooooo good together. I've been adding warm wood tones and pastel jadeite greens to my kitchen but still keeping the monochromatic vibe. There's colorful art above the stove and to the right of the window that do the rest of the work for me, lol.